Please find a short bio below and do not hesitate to get in touch. 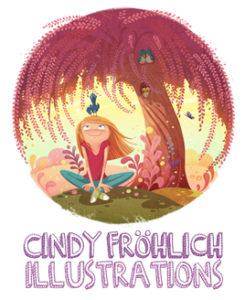 Cindy Fröhlich is a freelance illustrator living and working in Hamburg, Germany. She was born in the city of Stade and grew up with four siblings in Oldendorf, Lower Saxony. Her enthusiasm for drawing expressed itself at an early age and after graduating high school, she worked in animation for a while. During this time, she studied “Illustration and Computer Graphics” by distance learning, completing the course to receive a diploma. Afterwards, she continued her studies at Animation School Hamburg to become a 2D animation designer and upon completion, decided to go out on her own as a freelance illustrator. Since 2010 she has predominantly produced illustrations for the child and youth sector and also continues to work as a concept and background artist for the animation industry. One of her favorite characters is her dog Alegria, who she features in a series of short stories.